Motorcycles are powered one of three ways: chain-driven, belt-driven, or shaft-driven. Shaft- and belt-driven bikes require less frequent maintenance than chain-driven ones. Most cruisers are belt-driven, while most sport bikes are chain-driven. BMW isn't the only company that makes shaft-driven bikes, but they're the most common bikes on which you'll find the system. Why does this matter? When you're riding a bike, that chain or belt or shaft is what keeps your bike moving. There isn't a lot to examine on a shaft-driven bike (if it's broken, you'll know it), but you should check your chain or belt before you head out. If that chain or belt is in bad condition, or is improperly adjusted, it can break. At the least, that means you're walking home. At the most, it can cause you to have an accident. 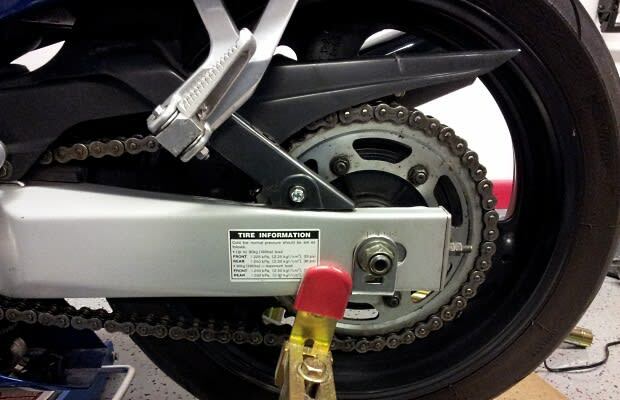 To inspect a chain, turn the rear wheel and watch the chain move. Does it move freely? Do any of the links looked cracked or worn? Is it really, really dirty? Does it seem really loose or really tight? A chain in good condition should move freely and should not be super loose or super tight. (Proper chain adjustment is its own topic) Chains get dirty as you ride, but it shouldn't be so dirty that the grime is preventing smooth movement. If a chain gets too dirty, it can get stiff and not move smoothly like it should. That's why proper bike maintenance of chain driven bikes includes cleaning and waxing your chain regularly. If that chain has broken or missing links, don't ride it until you replace the chain. It's not safe. To inspect a belt, turn the rear wheel and watch the belt move. Does it move smoothly? Does it have any weird cracks or tears, or does it look like it's been chewed at the edges, or along any of the teeth? If it has any cracks, tears, or jagged edges like it's been chewed, it's due for replacement. You probably shouldn't ride it until it's replaced. Finally, check for any oil or other fluids leaking anywhere on the bike. Look at the front forks as well, because they have fluid inside. If the seals on the forks need to be replaced, you may see some fluid seeping out. If anything is leaking, get your bike checked out by someone who knows what they're doing.